Dr Jose Ignacio Valenzuela, an award-winning physician and MSc Health Informatics alumnus (2006), speaks about the challenges and rewards involved in developing ‘Doctor Chat’, and the first eLearning health programme in his country. Award-winning Columbian physician, Dr Jose Ignacio Valenzuela, was a featured interviewee at this year’s Cass Innovate on 13th September. Themed The Future is Now, Cass Innovate brought together 200 academics, practitioners and students to explore ways in which rapidly evolving technologies have transformed the ways we now work, create and do business. 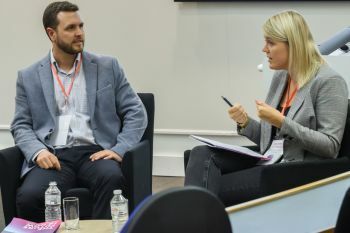 Interviewed by Dr Annelore Huyghe, a Senior Lecturer in Entrepreneurship at Cass Business School, Dr Valenzuela spoke about the challenges he faced in developing ‘Doctor Chat’ and the first eLearning health programme in Columbia. The idea of having an eLearning Health programme in Colombia was born out of Dr Valenzuela's dissatisfaction from having to travel from one hospital to the other in Colombia taking patient information. This soon changed when a colleague showed him his Palm Pilot (personal digital assistant) and demonstrated how he could take patient information and synchronise this to a computer. The experience was a 'light bulb moment' for Dr Valenzuela, who saw the impact of using data to make clinical decisions in real time. "The whole idea of integrating messaging with the internet back then was not even conceivable, so as a physician, I had to start studying Java programming before discovering that there were people a whole lot more competent than me at creating computer programs." Returning to Columbia after my Health Informatics Masters degree at City gave me the opportunity to assist in shaping the legislation and regulation around a very young field in Latin America. When people heard of my expertise in the area, they started involving me in the regulatory process. My City qualification became part and parcel of my brand, so to speak, as an advocate for digital health. Dr Valenzuela is a medical practitioner at the Fundacion Santa Fe De Bogota, where he established the Clinical Informatics section of the hospital’s Department of Internal Medicine. He is also the winner of a 2018 British Council Study UK Alumni Award which highlights outstanding achievement and showcases the impact and value of completing higher education in the UK.